IT'S OFFICIAL! The URP on Vancouver Co-op Radio 100.5FM IS HAVING A PARTY !!! 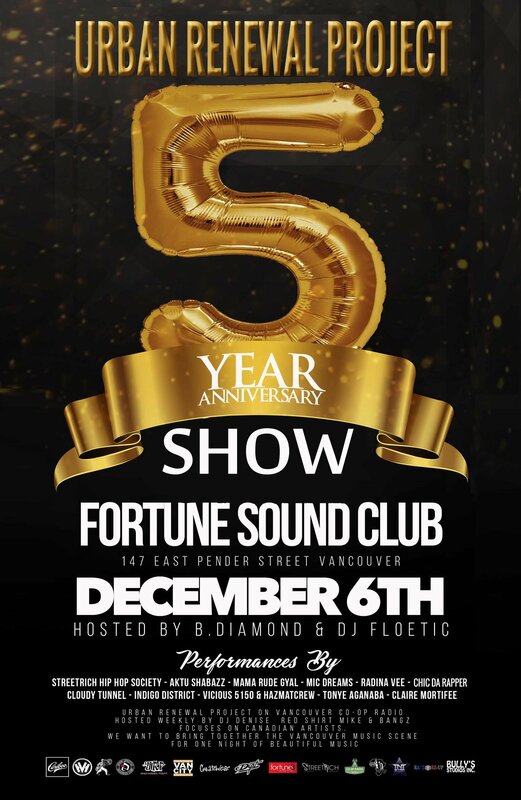 Come down to Fortune Sound on Dec 6th. Enjoy a night of Live performances and help us Celebrate!! This annual fundraiser strengthens the Vancouver urban music scene. A raffle apparel prize pack from Ephin will end the night! We would like to acknowledge that this event is taking place on unceded Coast Salish land and the ancestral homeland of the Musqueam, Squamish and Tsleil-Waututh Nations. Sponsored by Cariboo Brewing, Ephin Apparel, Createwear Apparel, & HIPHOPVANCOUVER.COM (HHVtv), Spliff Splee , Bully's Studios INC, One Love, Emily Starr/Rave Re-Up, Streetrich Vancity, The Georgia Straight, Jenn and Juice Management, @T N T Star Entertainment. We will be broadcasting LIVE on location at Fortune Sound Club. December 6th on CiTR Radio 101.9FM (101.9fm) citr.ca and Vancouver Co-op Radio CFRO (100.5fm) coopradio.org during the recording artist showcase part of the show.